Everyone loves popcorn! Newly updated with the latest research, a delicious 40th anniversary edition of a POP-ular classic. Tony likes to cook. Tiny likes to read. And both twins like to eat . . . POPCORN! So while Tiny cooks it, Tony reads about it: what popcorn is, how it's stored and prepared, legends and stories about it, and its history in Europe and North America. 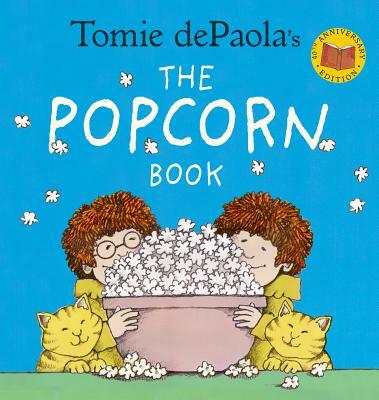 A favorite since its original release in 1978, The Popcorn Book has sold nearly a million copies. This fresh new edition features refreshed interiors with bolder colors, and revised text-- updated with new information and vetted for accuracy by a Native American expert. Colorful, funny, and informative, this nonfiction classic from the best-selling author-illustrator of Quiet, Strega Nona, and many more will teach you everything you need to know about this favorite snack food-- and leave you hungry for more. And because the best thing about popcorn is eating it, two great recipes for popping corn are included! Tomie dePaola is the beloved Caldecott Honor- and Newbery Honor-winning author and/or illustrator of close to 250 books, including Strega Nona and Quiet. Tomie was born in Connecticut and grew up there with his parents, brother, and two sisters. He loved reading and books from an early age and knew, when he was four, that he wanted to write and illustrate stories when he grew up. Tomie is the recipient of numerous awards and honors, including the Laura Ingalls Wilder Award from the American Library Association for his "substantial and lasting contribution to literature for children," the Smithson Medal from the Smithsonian Institution, the Regina Medal from the Catholic Library Association, and the Kerlan Award from the University of Minnesota for his "singular attainment in children's literature." He was nominated for the Hans Christian Andersen Award in illustration and has received the New Hampshire's Governor's Arts Award of Living Treasure.